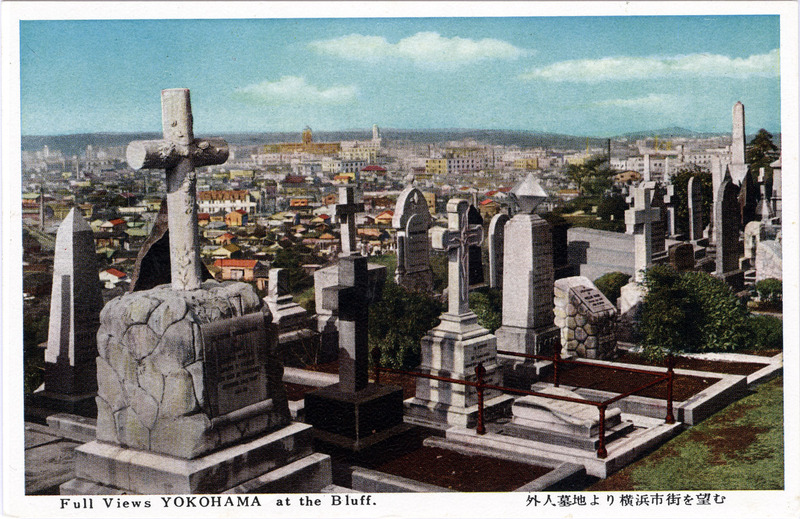 Yokohama Foreign Cemetery, c. 1940. A view of Yokohama, c. 1940, as seen from the Foreign Cemetery. In the distance are the towers of the Kanagawa Prefecture Office, and “Jack’s Tower” (Port Opening Memorial Hall). “In the earliest days of foreign residence in Yokohama, the Japanese Government treated us in a right royal and liberal manner. As since at Hiogo, and Osaka, and the sister settlements, the native Government granted to the subjects of all treaty powers a portion of ground to be used exclusively as a Cemetery. This ground was given without any charge for ground rent or even any tax whatsoever if we remember. From the wiki: “The Yokohama Foreign General Cemetery, located in Yamate Naka-ku, Yokohama, and one of four cemeteries for foreigners in the port city, was first established in 1859 soon after the opening of the Port of Yokohama. The current cemetery consists of 22 sections in an area of 18,500 square meters. In 1864, a memorandum for the foreign settlement at Yokohama was signed by the Tokugawa shogunate with the legations of the main trading nations permitting the extension of the cemetery area to the top of the Bluff opposite the Anglican Christ Church. “On the weekends of the spring, summer and fall (from noon to 4:00 p.m.), the cemetery is opened up to the public for a small donation to help with the upkeep of the premises. Visitors will get a small pamphlet showing graves of interest, and they can also view the museum at the site.